This article is about the physicist and priest. For the spacecraft, see Georges Lemaître ATV. For the winner of the world's first motor race, see Georges Lemaitre (motorist). Georges Henri Joseph Édouard Lemaître, RAS Associate (French: [ʒɔʁʒᵊ ləmɛ:tʁᵊ] ( listen); 17 July 1894 – 20 June 1966) was a Belgian Roman Catholic priest, mathematician, astronomer, and professor of physics at the Catholic University of Louvain. He was the first to identify that the recession of nearby galaxies can be explained by a theory of an expanding universe, which was observationally confirmed soon afterwards by Edwin Hubble. He was the first to derive what is now known as Hubble's law, or the Hubble-Lemaître law, and made the first estimation of what is now called the Hubble constant, which he published in 1927, two years before Hubble's article. Lemaître also proposed what became known as the "Big Bang theory" of the creation of the universe, originally calling it the "hypothesis of the primeval atom". After a classical education at a Jesuit secondary school, the Collège du Sacré-Coeur, in Charleroi, Lemaître began studying civil engineering at the Catholic University of Louvain at the age of 17. In 1914, he interrupted his studies to serve as an artillery officer in the Belgian army for the duration of World War I. At the end of hostilities, he received the Belgian War Cross with palms. After the war, he studied physics and mathematics, and began to prepare for the diocesan priesthood, not for the Jesuits. He obtained his doctorate in 1920 with a thesis entitled l'Approximation des fonctions de plusieurs variables réelles (Approximation of functions of several real variables), written under the direction of Charles de la Vallée-Poussin. He was ordained a priest on 22 September 1923 by the Cardinal Mercier. In 1923, he became a research associate in astronomy at Cambridge UK, spending a year at St Edmund's House (now St Edmund's College, University of Cambridge). He worked with Arthur Eddington, who introduced him to modern cosmology, stellar astronomy, and numerical analysis. He spent the next year at Harvard College Observatory in Cambridge, Massachusetts, with Harlow Shapley, who had just gained renown for his work on nebulae, and at the Massachusetts Institute of Technology (MIT), where he registered for the doctoral program in sciences. On his return to Belgium in 1925, he became a part-time lecturer at the Catholic University of Louvain. He began the report which brought him international fame when it was published in 1927 in the Annales de la Société Scientifique de Bruxelles (Annals of the Scientific Society of Brussels) under the title "Un Univers homogène de masse constante et de rayon croissant rendant compte de la vitesse radiale des nébuleuses extragalactiques" ("A homogeneous Universe of constant mass and growing radius accounting for the radial velocity of extragalactic nebulae"). In this report, he presented his new idea that the universe is expanding, which he derived from General Relativity; this later became known as Hubble's law, even though Lemaître was the first to provide an observational estimate of the Hubble constant. The initial state he proposed was taken to be Einstein's own model of a finitely sized static universe. The paper had little impact because the journal in which it was published was not widely read by astronomers outside Belgium; Arthur Eddington reportedly helped translate the article into English in 1931, but the part of it pertaining to the estimation of the "Hubble constant" was not included in the translation for reasons that remained unknown for a long time. This issue was clarified in 2011 by Mario Livio; Lemaître omitted the paragraphs written by himself upon initially translating the paper for the Royal Astronomical Society, in favour of reports of new work on the subject, since by that time Hubble's calculations had already improved on his earlier ones. At this time, Einstein, while not taking exception to the mathematics of Lemaître's theory, refused to accept that the universe was expanding; Lemaître recalled his commenting "Vos calculs sont corrects, mais votre physique est abominable" ("Your calculations are correct, but your physics is atrocious"). In the same year, Lemaître returned to MIT to present his doctoral thesis on The gravitational field in a fluid sphere of uniform invariant density according to the theory of relativity. Upon obtaining his Ph.D., he was named ordinary professor at the Catholic University of Louvain. In 1931, Arthur Eddington published in the Monthly Notices of the Royal Astronomical Society a long commentary on Lemaître's 1927 article, in which he described the latter as a "brilliant solution" to the outstanding problems of cosmology. The original paper was published in an abbreviated English translation later on in 1931, along with a sequel by Lemaître responding to Eddington's comments. Lemaître was then invited to London to participate in a meeting of the British Association on the relation between the physical universe and spirituality. There he proposed that the universe expanded from an initial point, which he called the "Primeval Atom". He developed this idea in a report published in Nature. Lemaitre's theory appeared for the first time in an article for the general reader on science and technology subjects in the December 1932 issue of Popular Science. Lemaître's theory became better known as the "Big Bang theory," a picturesque term playfully coined during a 1949 BBC radio broadcast by the astronomer Fred Hoyle, who was then still a proponent of the steady state universe and remained so until his death in 2001. Lemaître's proposal met with skepticism from his fellow scientists. Eddington found Lemaître's notion unpleasant. Einstein thought it unjustifiable from a physical point of view, although he encouraged Lemaître to look into the possibility of models of non-isotropic expansion, so it is clear he was not altogether dismissive of the concept. Einstein also appreciated Lemaître's argument that Einstein's model of a static universe could not be sustained into the infinite past. With Manuel Sandoval Vallarta, Lemaitre discovered that the intensity of cosmic rays varied with latitude because these charged particles are interacting with the Earth's magnetic field. In their calculations, Lemaître and Vallarta made use of MIT's differential analyzer computer developed by Vannevar Bush. They also worked on a theory of primary cosmic radiation and applied it to their investigations of the sun's magnetic field and the effects of the galaxy's rotation. Lemaître and Einstein met on four occasions: in 1927 in Brussels, at the time of a Solvay Conference; in 1932 in Belgium, at the time of a cycle of conferences in Brussels; in California in January 1933; and in 1935 at Princeton. In 1933 at the California Institute of Technology, after Lemaître detailed his theory, Einstein stood up, applauded, and is supposed to have said, "This is the most beautiful and satisfactory explanation of creation to which I have ever listened." However, there is disagreement over the reporting of this quote in the newspapers of the time, and it may be that Einstein was not referring to the theory as a whole, but only to Lemaître's proposal that cosmic rays may be the leftover artifacts of the initial "explosion". In 1933, when he resumed his theory of the expanding universe and published a more detailed version in the Annals of the Scientific Society of Brussels, Lemaître achieved his greatest public recognition. Newspapers around the world called him a famous Belgian scientist and described him as the leader of the new cosmological physics. He was elected a member of the Pontifical Academy of Sciences in 1936, and took an active role there, serving as its president from March 1960 until his death. In 1941, he was elected a member of the Royal Academy of Sciences and Arts of Belgium. In 1946, he published his book on L'Hypothèse de l'Atome Primitif (The Primeval Atom Hypothesis). It was translated into Spanish in the same year and into English in 1950. By 1951, Pope Pius XII declared that Lemaître's theory provided a scientific validation for Catholicism. However, Lemaître resented the Pope's proclamation, stating that the theory was neutral and there was neither a connection nor a contradiction between his religion and his theory. Lemaître and Daniel O'Connell, the Pope's scientific advisor, persuaded the Pope not to mention Creationism publicly, and to stop making proclamations about cosmology. While a devout Roman Catholic, he opposed mixing science with religion, although he held that the two fields were not in conflict. During the 1950s, he gradually gave up part of his teaching workload, ending it completely when he took emeritus status in 1964. In 1962, strongly opposed to the expulsion of French speakers from the Catholic University of Louvain, he created the ACAPSUL movement together with Gérard Garitte to fight against the split. During the Second Vatican Council of 1962–65 he was asked by Pope John XXIII to serve on the 4th session of the Pontifical Commission on Birth Control. However, since his health made it impossible for him to travel to Rome – he suffered a heart attack in December 1964 – Lemaître demurred, expressing surprise that he was chosen. He told a Dominican colleague, Père Henri de Riedmatten, that he thought it was dangerous for a mathematician to venture outside of his area of expertise. He was also named Dometisc prelate (Monsignor) in 1960 by Pope John XXIII. At the end of his life, he was increasingly devoted to problems of numerical calculation. He was a remarkable algebraicist and arithmetical calculator. Since 1930, he had used the most powerful calculating machines of the time, the Mercedes-Euklid. In 1958 he was introduced to the University's Burroughs E 101, its first electronic computer. Lemaître maintained a strong interest in the development of computers and, even more, in the problems of language and computer programming. He died on 20 June 1966, shortly after having learned of the discovery of cosmic microwave background radiation, which provided further evidence for his proposal about the birth of the universe. Lemaître was a pioneer in applying Albert Einstein's theory of general relativity to cosmology. In a 1927 article, which preceded Edwin Hubble's landmark article by two years, Lemaître derived what became known as Hubble's law and proposed it as a generic phenomenon in relativistic cosmology. Lemaître was also the first to estimate the numerical value of the Hubble constant. Einstein was skeptical of this paper. When Lemaître approached Einstein at the 1927 Solvay Conference, the latter pointed out that Alexander Friedmann had proposed a similar solution to Einstein's equations in 1922, implying that the radius of the universe increased over time. (Einstein had also criticized Friedmann's calculations, but withdrew his comments.) In 1931, his annus mirabilis, Lemaître published an article in Nature setting out his theory of the "primeval atom." Had studied under Arthur Eddington, who made sure that Lemaître got a hearing in the scientific community. Lemaître was also an early adopter of computers for cosmological calculations. He introduced the first computer to his university (a Burroughs E 101) in 1958 and was one of the inventors of the Fast Fourier transform algorithm. In 1933, Lemaître found an important inhomogeneous solution of Einstein's field equations describing a spherical dust cloud, the Lemaître–Tolman metric. In 1931, Lemaitre was the first scientist to propose the expansion of the universe was actually accelerating which was confirmed observationally in the 1990s through observations of very distant Type IA supernova with the Hubble Space Telescope which led to the 2011 Nobel Prize in Physics. In 1948 Lemaître published a polished mathematical essay "Quaternions et espace elliptique" which clarified an obscure space. William Kingdon Clifford had cryptically described elliptic space in 1873 at a time when versors were too common to mention. Lemaître developed the theory of quaternions from first principles so that his essay can stand on its own, but he recalled the Erlangen program in geometry while developing the metric geometry of elliptic space. H. S. M. Coxeter, another contributor to elliptic geometry, summarized Lemaître's work for Mathematical Reviews. Lemaître was the first theoretical cosmologist ever nominated in 1954 for the Nobel Prize in physics for his prediction of the expanding universe. Remarkably, he was also nominated for the 1956 Nobel prize in chemistry for his primeval-atom theory. On 17 March 1934, Lemaître received the Francqui Prize, the highest Belgian scientific distinction, from King Leopold III. His proposers were Albert Einstein, Charles de la Vallée-Poussin and Alexandre de Hemptinne. The members of the international jury were Eddington, Langevin, Théophile de Donder and Marcel Dehalu. The same year he received the Mendel Medal of the Villanova University. In 1936, Lemaître received the Prix Jules Janssen, the highest award of the Société astronomique de France, the French astronomical society. Another distinction that the Belgian government reserves for exceptional scientists was allotted to him in 1950: the decennial prize for applied sciences for the period 1933–1942. In 2005, Lemaître was voted to the 61st place of De Grootste Belg ("The Greatest Belgian"), a Flemish television program on the VRT. In the same year he was voted to the 78th place by the audience of the Les plus grands Belges ("The Greatest Belgians"), a television show of the RTBF. On 17 July 2018, Google Doodle celebrated Georges Lemaître's 124th birthday. On 26 October 2018, an electronic vote among all members of the International Astronomical Union voted 78% to recommend changing the name of the Hubble law to the Hubble–Lemaître law. G. Lemaître, The Primeval Atom – an Essay on Cosmogony, D. Van Nostrand Co, 1946. Lemaître, G. (1931). "The Evolution of the Universe: Discussion". Nature. 128 (3234): 699–701. Bibcode:1931Natur.128..704L. doi:10.1038/128704a0. Lemaître, G. (1927). "Un univers homogène de masse constante et de rayon croissant rendant compte de la vitesse radiale des nébuleuses extragalactiques". Annals of the Scientific Society of Brussels (in French). 47A: 41. Lemaître, Georges (9 May 1931). "The Beginning of the World from the Point of View of Quantum Theory". Nature. 127 (3210): 706. Bibcode:1931Natur.127..706L. doi:10.1038/127706b0. Retrieved 28 February 2012. Michał Heller – Polish catholic priest and physicist/astronomer. ^ "1967QJRAS...8..294. Page 297". Quarterly Journal of the Royal Astronomical Society. 8: 294. 1967. Bibcode:1967QJRAS...8..294. ^ a b Lemaître, G. (April 1927). "Un Univers homogène de masse constante et de rayon croissant rendant compte de la vitesse radiale des nébuleuses extra-galactiques". Annales de la Société Scientifique de Bruxelles (in French). 47: 49. Bibcode:1927ASSB...47...49L. ^ Reich, Eugenie Samuel (27 June 2011). "Edwin Hubble in translation trouble". Nature. doi:10.1038/news.2011.385. ^ Livio, Mario (10 November 2011). "Lost in translation: Mystery of the missing text solved". Nature. 479 (7372): 171–173. Bibcode:2011Natur.479..171L. doi:10.1038/479171a. PMID 22071745. ^ "name change for Hubble Law". nature.com. Retrieved 5 November 2018. The International Astronomical Union recommends that the law should now be known as the Hubble–Lemaître law, to pay tribute to the Belgian priest and astronomer Georges Lemaître, who derived the speed–distance relationship two years earlier than did US astronomer Edwin Hubble. ^ a b "International Astronomical Union members vote to recommend renaming the Hubble law as the Hubble–Lemaître law". iau.org. 29 October 2018. Retrieved 5 November 2018. ^ a b van den Bergh, Sidney (6 June 2011). "The Curious Case of Lemaitre's Equation No. 24". Journal of the Royal Astronomical Society of Canada. 105 (4): 151. arXiv:1106.1195. Bibcode:2011JRASC.105..151V. ^ Block, David L. (2012). Georges Lemaître and Stigler's Law of Eponymy. Astrophysics and Space Science Library. 395. pp. 89–96. arXiv:1106.3928v2. doi:10.1007/978-3-642-32254-9_8. ISBN 978-3-642-32253-2. ^ Reich, Eugenie Samuel (27 June 2011). "Edwin Hubble in translation trouble". Nature. doi:10.1038/news.2011.385. ISSN 1476-4687. ^ Livio, Mario (1 November 2011). "Mystery of the missing text solved". Nature. 479 (7372): 171–173. Bibcode:2011Natur.479..171L. doi:10.1038/479171a. PMID 22071745. ^ "Big bang theory is introduced – 1927". A Science Odyssey. WGBH. Retrieved 31 July 2014. ^ "Croix de guerre, reçue en 1918 et la palme en 1921 (Georges Lemaître)". archives.uclouvain.be. Retrieved 7 September 2018. ^ Farrell, John (22 March 2008). "The Original Big Bang Man" (PDF). The Tablet. Retrieved 7 April 2015. ^ Lambert, Dominique (1996). "Mgr Georges Lemaître et les "Amis de Jésus"". Revue Théologique de Louvain (in French). 27 (3): 309–343. doi:10.3406/thlou.1996.2836. ISSN 0080-2654. ^ a b Lambert, Dominique (1997). "Monseigneur Georges Lemaître et le débat entre la cosmologie et la foi (à suivre)". Revue Théologique de Louvain (in French). 28 (1): 28–53. doi:10.3406/thlou.1997.2867. ISSN 0080-2654. ^ Belenkiy, Ari (2012). "Alexander Friedmann and the origins of modern cosmology". Physics Today. 65 (10): 38. Bibcode:2012PhT....65j..38B. doi:10.1063/PT.3.1750. ^ Way, Michael; Nussbaumer, Harry (2011). "Lemaître's Hubble relationship". Physics Today. 64 (8): 8. arXiv:1104.3031. Bibcode:2011PhT....64h...8W. doi:10.1063/PT.3.1194. ^ Livio, Mario (2011). "Mystery of the missing text solved". Nature. 479 (7372): 171–173. Bibcode:2011Natur.479..171L. doi:10.1038/479171a. ISSN 0028-0836. PMID 22071745. ^ Lemaitre, Georges H. J. E (1927). "The gravitational field in a fluid sphere of uniform invariant density according, to the theory of relativity ; Note on de Sitter ̕Universe ; Note on the theory of pulsating stars" (PDF). Massachusetts Institute of Technology. Dept. Of Physics. ^ Eddington, A. S. (1930). "On the instability of Einstein's spherical world". Monthly Notices of the Royal Astronomical Society. 90 (7): 668–688. Bibcode:1930MNRAS..90..668E. doi:10.1093/mnras/90.7.668. ^ Lemaître, G. (1931). "The Beginning of the World from the Point of View of Quantum Theory". Nature. 127 (3210): 706. Bibcode:1931Natur.127..706L. doi:10.1038/127706b0. ^ Menzel, David (December 1932). "A blast of Giant Atom created our universe". Popular Science. Bonnier Corporation. p. 52. ^ "Third Programme - 28 March 1949 - BBC Genome". genome.ch.bbc.co.uk. Retrieved 4 September 2018. ^ "Hoyle on the Radio: Creating the 'Big Bang'". www.joh.cam.ac.uk. Retrieved 4 September 2018. ^ Lemaitre, G.; Vallarta, M. S. (15 January 1933). "On Compton's Latitude Effect of Cosmic Radiation". Physical Review. 43 (2): 87–91. Bibcode:1933PhRv...43...87L. doi:10.1103/PhysRev.43.87. ^ Kragh, Helge, 1996. Cosmology and Controversy". p. 55. ^ Lemaitre, G. (1934). 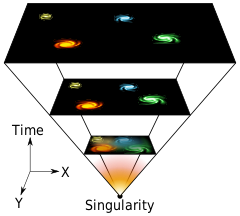 "Evolution of the Expanding Universe". Proceedings of the National Academy of Sciences of the United States of America. 20 (1): 12–17. Bibcode:1934PNAS...20...12L. doi:10.1073/pnas.20.1.12. ISSN 0027-8424. PMC 1076329. PMID 16587831. ^ "Georges Lemaitre". Pontifical Academy of Science. Retrieved 4 September 2018. ^ a b c d "Rapport Jury Mgr Georges Lemaître". Fondation Francqui – Stichting (in French). 1934. Retrieved 4 September 2018. ^ Pope XII (22 November 1951). "Ai Cardinali, ai Legati delle Nazioni Estere e ai Soci della Pontificia Accademia delle Scienze". www.vatican.va. Retrieved 3 September 2018. ^ Peter T. Landsberg (1999). Seeking Ultimates: An Intuitive Guide to Physics, Second Edition. CRC Press. p. 236. ISBN 978-0-7503-0657-7. Indeed the attempt in 1951 by Pope Pius XII to look forward to a time when creation would be established by science was resented by several physicists, notably by George Gamow and even George Lemaitre, a member of the Pontifical Academy. ^ Simon Singh (2010). Big Bang. HarperCollins UK. p. 362. ISBN 978-0-00-737550-9. Lemaître was determined to discourage the Pope from making proclamations about cosmology, partly to halt the embarrassment that was being caused to supporters of the Big Bang, but also to avoid any potential difficulties for the Church. ...Lemaître contacted Daniel O'Connell, director of the Vatican Observatory and the Pope's science advisor, and suggested that together they try to persuade the Pope to keep quiet on cosmology. The Pope was surprisingly compliant and agreed to the request–the Big Bang would no longer be a matter suitable for Papal addresses. ^ Simon Singh (2010). Big Bang. HarperCollins UK. p. 362. ISBN 978-0-00-737550-9. It was Lemaître's firm belief that scientific endeavour should stand isolated from the religious realm. With specific regard to his Big Bang theory, he commented: 'As far as I can see, such a theory remains entirely outside any metaphysical or religious question.' Lemaître had always been careful to keep his parallel careers in cosmology and theology on separate tracks, in the belief that one led him to a clearer comprehension of the material world, while the other led to a greater understanding of the spiritual realm.... Not surprisingly, he was frustrated and annoyed by the Pope's deliberate mixing of theology and cosmology. One student who saw Lemaître upon his return from hearing the Pope's address to the Academy recalled him 'storming into class...his usual jocularity entirely missing'. ^ "ACAPSUL – Association du corps académique et du personnel scientifique de l'Université de Louvain". ^ McClory, Robert (1998). "Appendice II: Membres de la Commission". Rome et la contraception: histoire secrète de l'encyclique Humanae vitae (in French). Editions de l'Atelier. p. 205. ISBN 9782708233423. ^ Lambert, Dominique, 2000. Un Atome d'Univers. Lessius, p. 302. ^ "Georges Lemaître: Who was the Belgian priest who discovered the universe is expanding?". 16 July 2018. ^ Luminet, Jean-Pierre (2011). "Editorial note to: Georges Lemaître, The beginning of the world from the point of view of quantum theory". General Relativity and Gravitation. 43 (10): 2911–2928. arXiv:1105.6271. Bibcode:2011GReGr..43.2911L. doi:10.1007/s10714-011-1213-7. ISSN 0001-7701. ^ Lemaître, Georges (9 May 1931). "The Beginning of the World from the Point of View of Quantum Theory". Nature. 127 (3210): 706. Bibcode:1931Natur.127..706L. doi:10.1038/127706b0. Retrieved 28 February 2012. ^ Simon Singh, Big Bang. ^ Longair, Malcolm (2007). The Cosmic Century. United Kingdom: Cambridge University Press. pp. 118–119. ISBN 978-0-521-47436-8. ^ Riess, Adam G.; Filippenko, Alexei V.; Challis, Peter; Clocchiatti, Alejandro; Diercks, Alan; Garnavich, Peter M.; Gilliland, Ron L.; Hogan, Craig J.; Jha, Saurabh; Kirshner, Robert P.; Leibundgut, B.; Phillips, M. M.; Reiss, David; Schmidt, Brian P.; Schommer, Robert A.; Smith, R. Chris; Spyromilio, J.; Stubbs, Christopher; Suntzeff, Nicholas B.; Tonry, John (1998). "Observational Evidence from Supernovae for an Accelerating Universe and a Cosmological Constant". The Astronomical Journal. 116 (3): 1009–1038. arXiv:astro-ph/9805201. Bibcode:1998AJ....116.1009R. doi:10.1086/300499. ISSN 0004-6256. ^ Steer, Ian (2013). "Lemaître's Limit". Journal of the Royal Astronomical Society of Canada. 107 (2): 57. arXiv:1212.6566. Bibcode:2013JRASC.107...57S. ISSN 0035-872X. ^ "Abbé Georges Edouard Etienne Lemaître, Ph.D., D.Sc. - 1934". Villanova University. Retrieved 5 September 2018. ^ "Médaille du prix Janssen décernée par la Société Astronomique de France à Georges Lemaître (1936)". archives.uclouvain.be. Retrieved 7 September 2018. ^ "Who was Georges Lemaître? Google Doodle celebrates 124th birthday of the astronomer behind the Big Bang Theory". ^ "Belgian priest recognized in Hubble law name change". Farrell, John (2005). The Day Without Yesterday: Lemaitre, Einstein, and the Birth of Modern Cosmology. New York: Thunder's Mouth Press. ISBN 978-1-56025-660-1. Holder, Rodney; Mitton, Simon (2013). Georges Lemaître: Life, Science and Legacy (Astrophysics and Space Science Library 395). Springer. ISBN 978-3-642-32253-2. Berenda, Carlton W (1951). "Notes on Lemaître's Cosmogony". The Journal of Philosophy. 48 (10): 338. doi:10.2307/2020873. JSTOR 2020873. Farrell, John, The Day Without Yesterday: Lemaître, Einstein and the Birth of Modern Cosmology (Basic Books, 2005), ISBN 978-1560256601. Lambert, Dominique, The Atom of the Universe: The Life and Work of Georges Lemaître (Copernicus Center Press, 2015), ISBN 978-8378860716. Kragh, Helge (1970). "Georges Lemaître" (PDF). In Gillispie, Charles (ed.). Dictionary of Scientific Biography. New York: Scribner & American Council of Learned Societies. pp. 542–543. ISBN 978-0-684-10114-9.